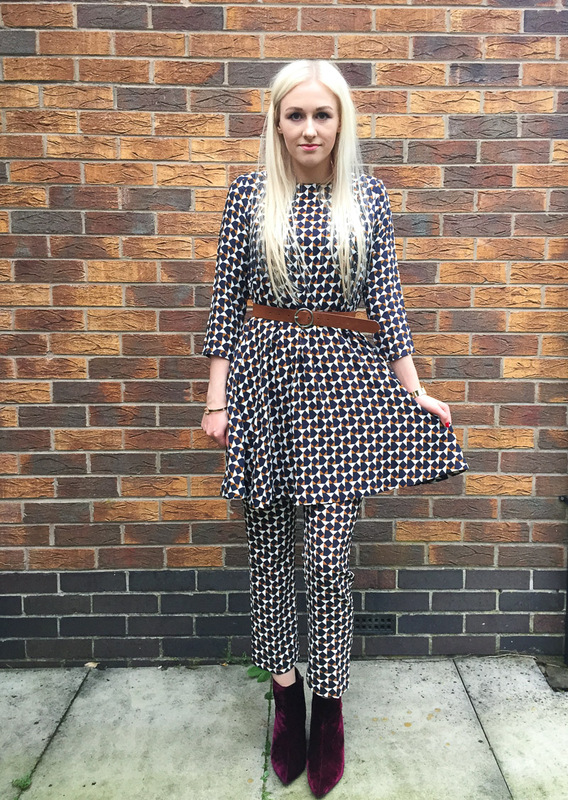 Today’s outfit post features a print I’m kinda obsessed with at the moment and that is this amazing geometric print. 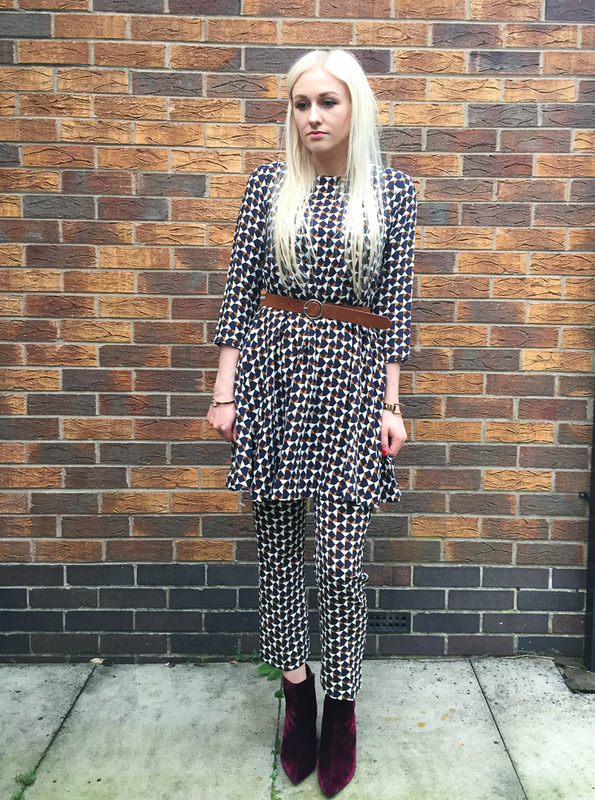 This flared dress and matching slack pants are from H&M. 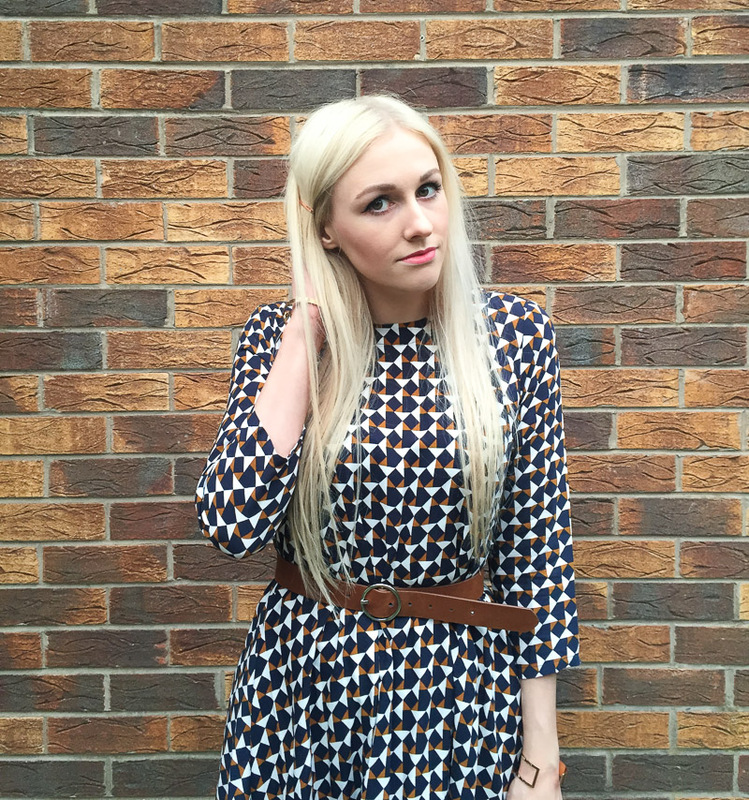 I have this style of dress from H&M in a couple of different prints which I got in the spring time and wore all summer long, so I was very happy to find they had brought out new patterns for fall. I purchased this particular dress back in September and also got it in plain navy. I’ve already been wearing the dress a lot with black tights and I just love the colour combination. So obviously when I saw they had brought out the matching pants I had to get them. Now, some may view it as a no no, but I’m actually a big fan of dresses over pants. I think that done right it can work really well and be a new, interesting way to wear some of your dresses. Since the whole co-ordination thing is a big trend, I decided to go all matchy matchy and wear the dress and slacks together. If this style isn’t necessarily for you though, the pants also look great with a shirt or a knitted jumper. I have an oversized camel jumper that I’m planning on wearing them with, especially now that the weather has turned so cold. 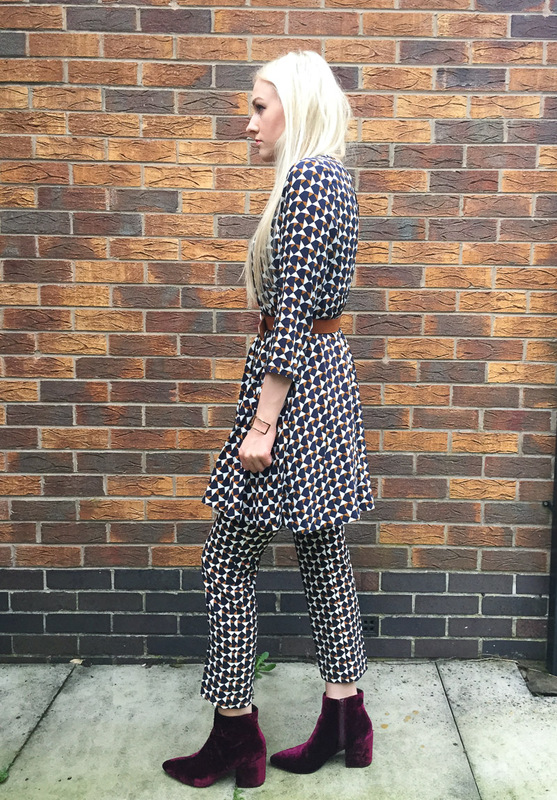 With it being quite a loose fitting dress I added a suede belt in tan to match part of the print. I love having a cinched in waist as I find it the most flattering style for me. I’m also wearing my deep red velvet boots which I can’t get enough of at the moment. I wanted to incorporate some colour into the look and I love how they add a clash and a bit of a twist. They’re still out of stock on Asos at the moment I’m afraid, but if you want to try checking for them their product name is ‘Radio Star Boots’, or you can use the link to them below.